Glass Door Lock for 6 to 10 mm Glass. 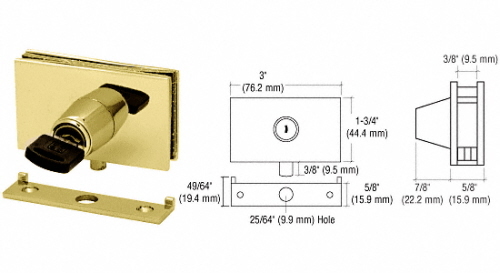 Glass Door Lock will fit 1/4 or 3/8 inch (6 or 10 millimeter) thick glass. Tightening is done by means of a counterplate (included). The key can be removed in both the open and locked position. Glass Door Lock will fit 1/4 or 3/8 inch (6 or 10 millimeter) thick glass. Tightening is done by means of a counterplate (included). The key can be removed in both the open and locked position. Lock is supplied with gaskets, two keys and a finish matching stop plate. A notch template is included in the package. Requires a glass notch cut-out from installation.